Because Augustine's The City of God has been a companion for so many years, it’s neither an adjunct nor an extension, but part of me, of my mind. Whenever I read a book and feel disappointed by it─as for example: The Dante Club, by Matthew Pearl─I quickly pick up The City and read a few pages. My faith in good writing is then restored. Besides the wisdom one finds in his book (Augustine being a rhetorician), one finds sentences that flow and gurgle in a crystal stream of sheer magic. How much more honourable a thing is to believe that which was taught by holy and truthful angels; uttered by prophets inspired by the Spirit of God; proclaimed by Him Who was foretold as the coming Saviour by the messengers who went before Him; and preached by the apostles whom He sent forth, and who filled the whole world with His Gospel! Why is The Dante Club boring? Because it is narrated with the pattern subject-verb-complement throughout. How long can a reader take of this annoying pattern before he puts the book down? Well, while I only read 24 pages before I put The Dante Club book down never to pick it up again, I will go on reading The City─its 1,200 pages─a lifetime. 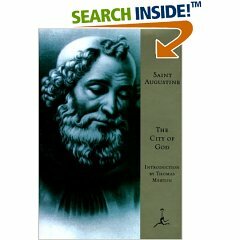 Comments on "Saint Augustine, The City of God"